Friday, February 13, 2015 Chicken Friday? I seem to be having trouble sticking with my usual progression of meals, i.e. Chicken Monday, GBOF Tuesday, etc. So somehow chicken got taken out of the freezer on Wednesday and cooked on Friday. I think it means that now all weekend I am going to think it’s Tuesday. Anyway, nothing new or surprising with the chicken. John coats the chicken with dukkah, a middle eastern rub of spices and ground nuts, browns it on the stove top and finishes it in the oven. Earlier I made a roasted butternut squash and mashed it with nutmeg and a little butter. While the chicken is in the oven I steam some petite green beans. John makes a little chicken gravy. A simple dinner but it is delicious! Tomorrow a yummy Valentine’s dinner! 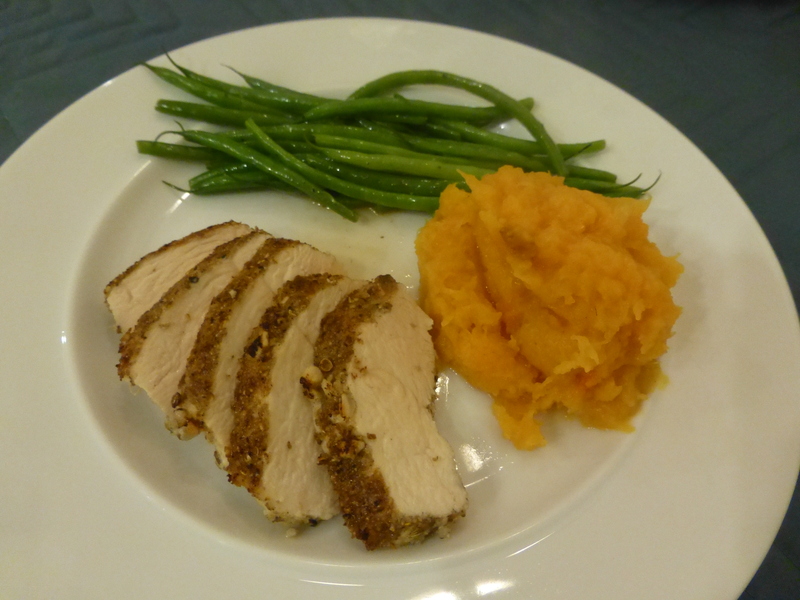 This entry was posted in Poultry and tagged butternut squash, chicken, chicken gravy, diet, green beans. Bookmark the permalink.